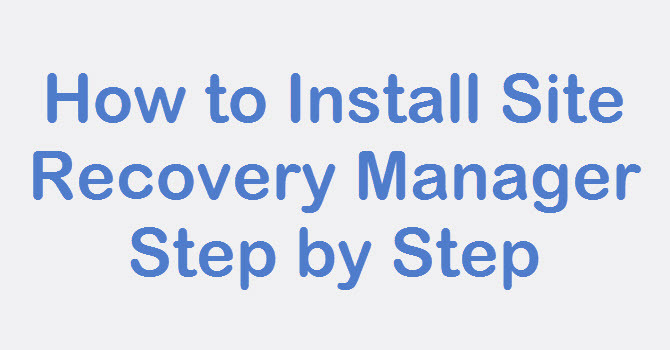 In previous post we have ran the Test Recovery plan for the virtual machine but in this post we will see on how to do live recovery of the virtual machine at DR Site by running recovery plan. Running Recovery plan is quite different compared to Test Recovery plan. 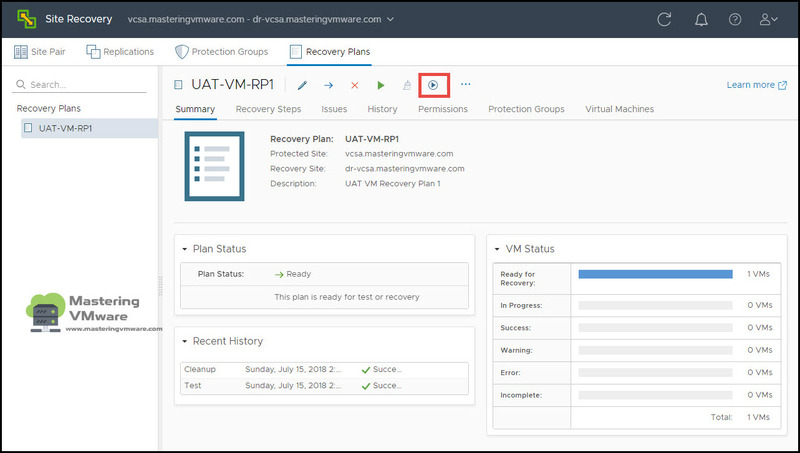 In Testing a recovery plan does not disrupt virtual machines at the protected site. 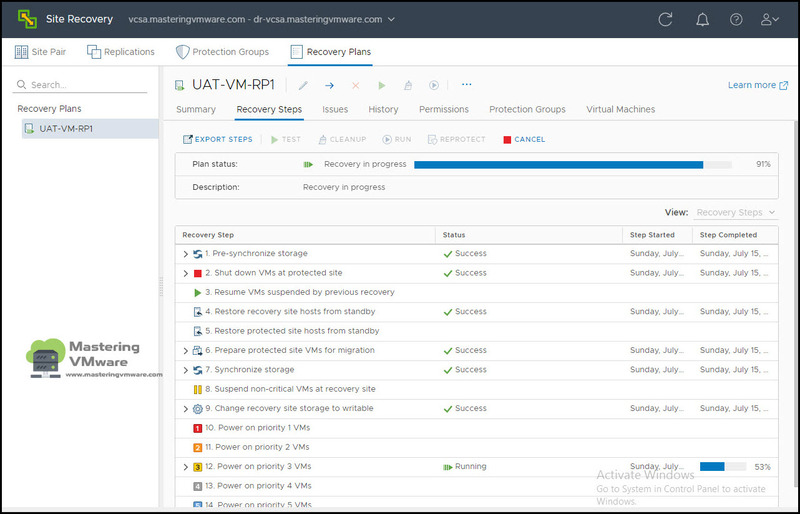 When running a recovery plan, Site Recovery Manager will attempt to shut down virtual machines at the protected site, and start the virtual machine at the Recovery site. 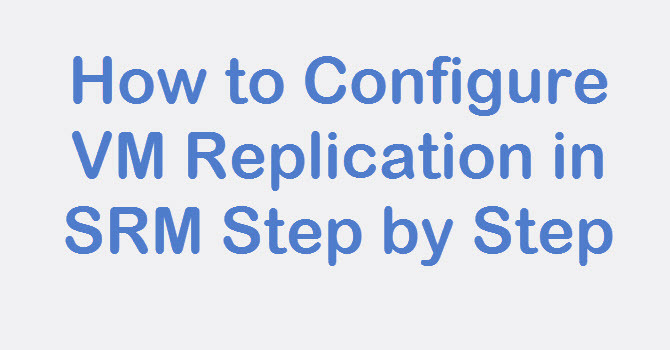 So your VM will be running from the Recovery site. 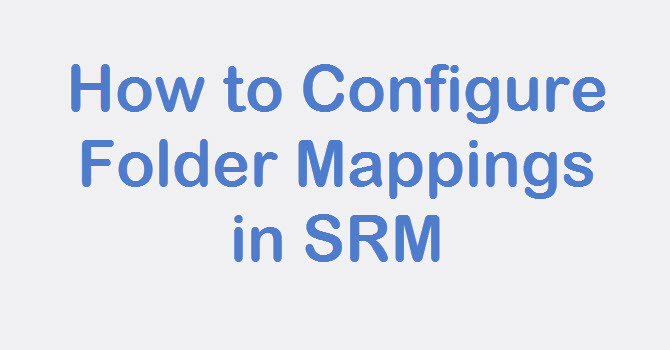 Recovery plans are run when a disaster has occurred and failover is required or when a planned migration is desired. If the protected site is offline due to a disaster, for example, the disaster recovery type should be selected. 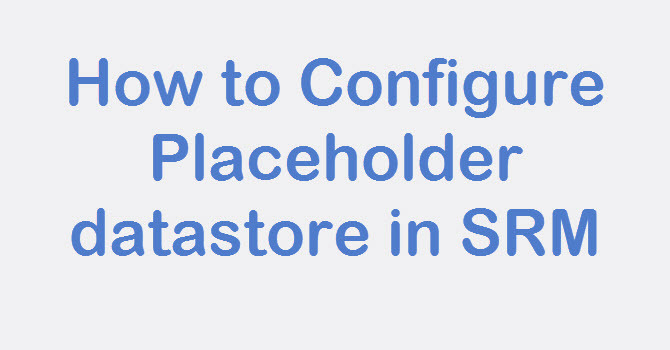 Site Recovery Manager will still attempt to synchronize storage as much as it can. 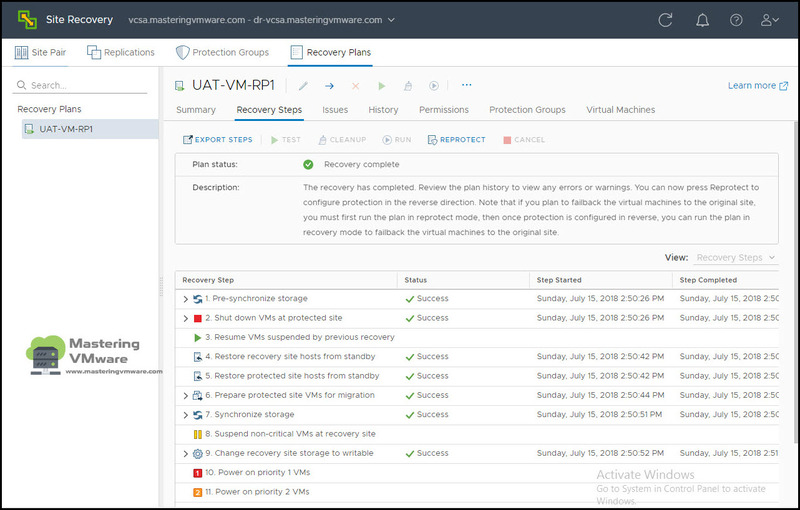 Since the protected site is offline, Site Recovery Manager will begin recovering virtual machines at the recovery site using the most recently replicated data. Select the Recovery Plan which you want to Run. 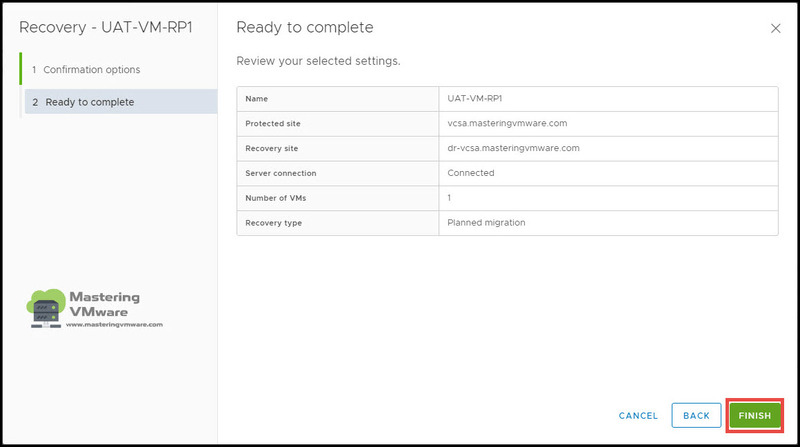 Click on the Recovery Icon as shown to run the Recovery. 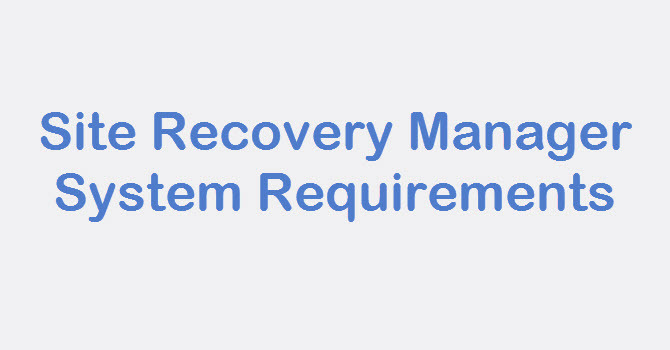 Here you will be asked for the recovery type confirmation whether is it planned migration or the disaster recovery. So you can choose accordingly. 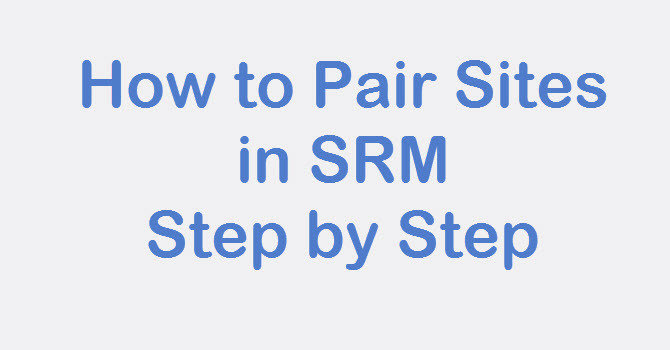 Click Finish to Run the Recovery Plan. 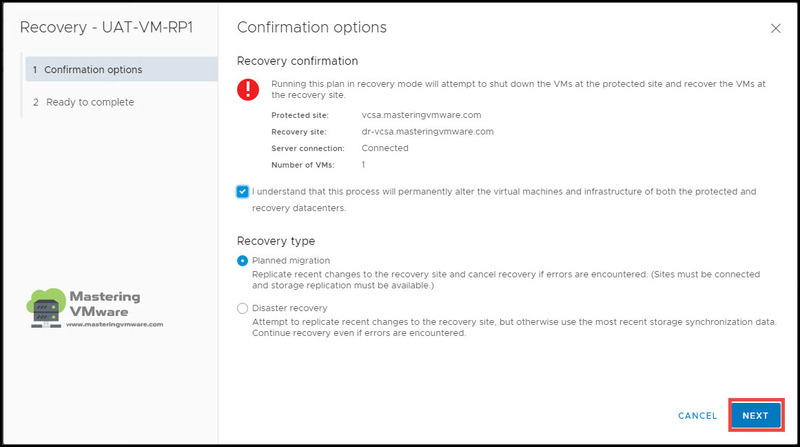 You can view the status of the Recovery of the virtual machine in the Recovery steps. You can see how the recovery operations is performed in each step. It can take few seconds or minutes based on your environment. Once the recovery is completed, you can see the confirmation status Recovery Complete success. Now you can check the virtual machine connectivity and data which you have recovered at the DR Site. 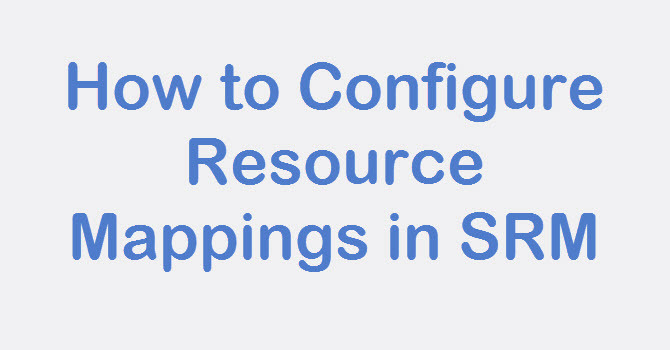 Using this way you can easily perform recovery of the virtual machines at the DR Site. You can perform recovery at times when you disaster has occurred or when you want to conduct a DR Drill. 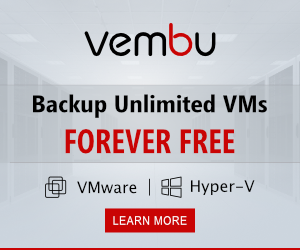 How to Reprotect VM in Site Recovery Manager ?